Delhiites had an opportunity to listen to ...Sugato Nag the other day.. Sugato remained unruffled by the delay in arrival and sailed through his recital with the ease of a veteran...... 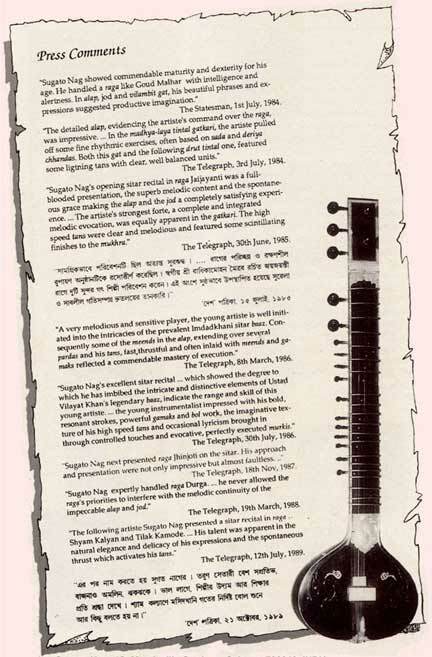 Considering the relatively narrow canvas of Gorak Kalyan - the Raga Sugato chose to render his alap, jod, jhala and compositions in - the general complexion of his treatment and its adequate lay-out deserved to be commended. .....Throughout the recital Sugato maintained admirable tunefulness with not a fumble or flicker anywhere. .....Sugato looks a highly practised artist with a high degree of precision and polish in his finger movements, specially in the phrases produced with the stretched string. 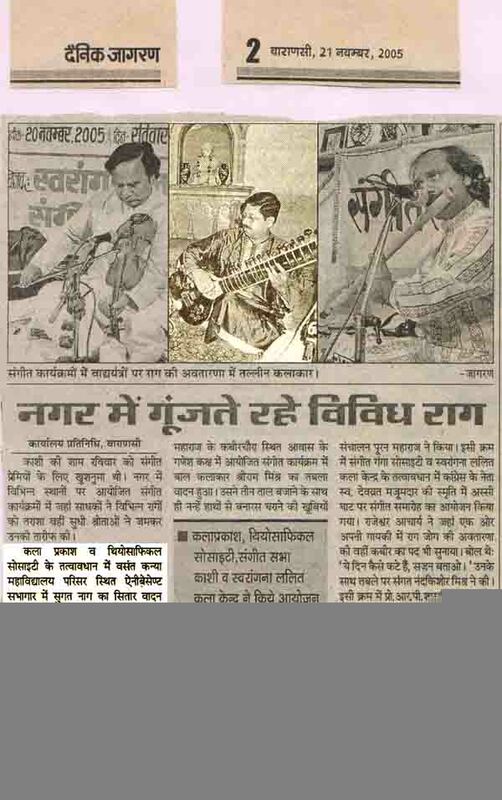 ...His concluding dhun in Khamaj revealed the artist's rich and romantic imagination rearing an unalloyed atmosphere of thumri. 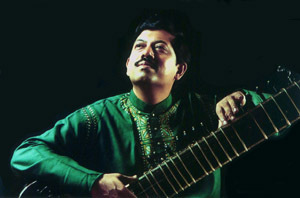 "Sugato Nag's opening sitar recital in raga Jaijayanti was a full blooded presentation, the superb melodic content and the spontaneous grace making the alap and the jod a completely satisfying experience.....The artiste's forte, a complete and integrated melodic evocation, was equally apparant in the gatkari. 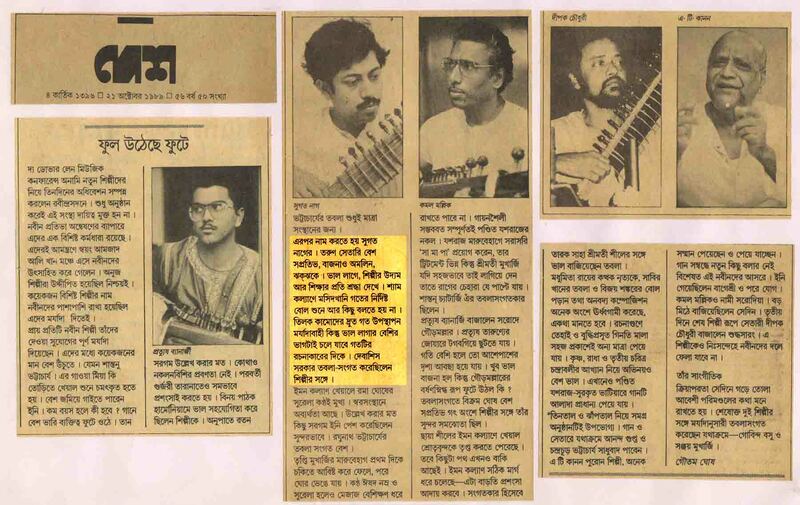 The high speed taans were clear and melodious and featured some scintillating finishes to the mukhra." "Sugato Nag showed commendable maturity and dexterity for his age. He handled a raga like Goud Mallhar with Intelligence and alertness. In alap, jod and vilambit gat, his beautiful phrases and expressions suggested productive imagination." 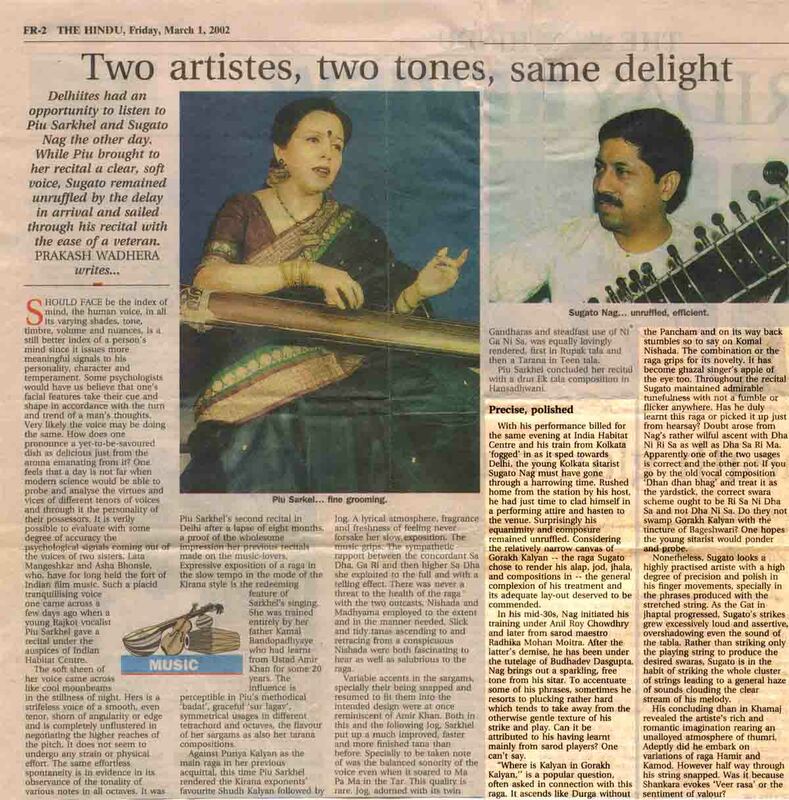 "A very melodious and sensitive player, the young artist is well initiated into the intricacies of the prevalant Imdadkhani sitar baaz. 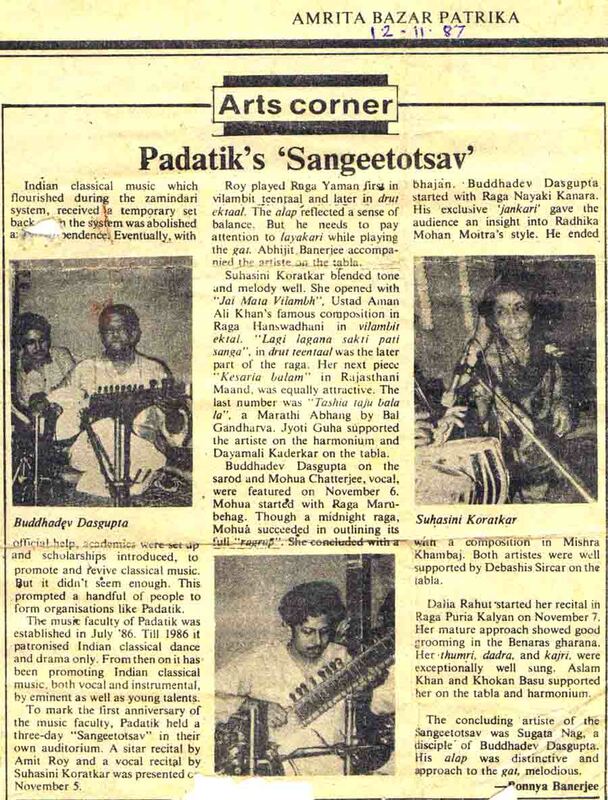 Consequently some of the meends in the alap, extending over several pardas and his taans, fast, thrustful and often inlaid with meends and gamaks reflected a commendable mastery of execution.."
"Sugato Nag's excellent sitar recital .... which showed the degree to which he has imbibed the intricate and distinctive elements of Ustad Vilayat Khan's legendaery baaz, indicate the range and skill of this young artist. 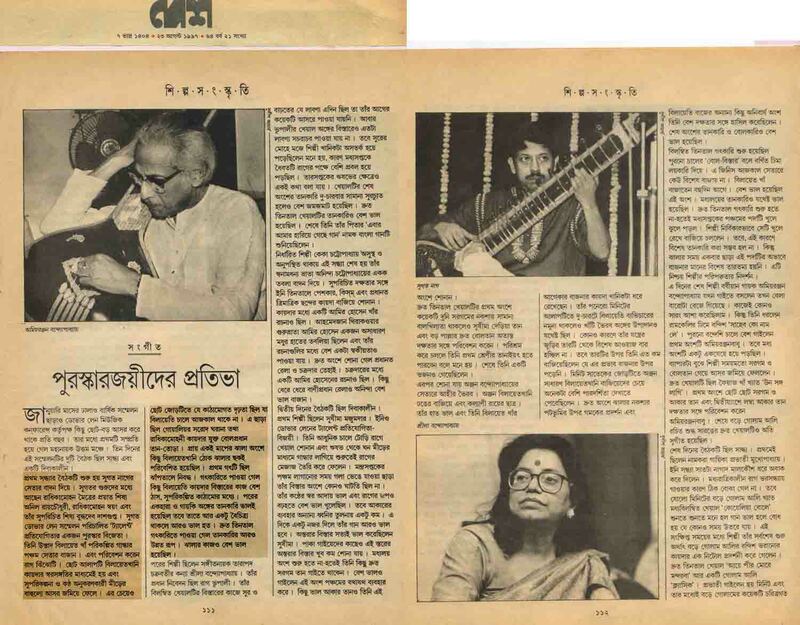 ....the young instrumentalist impressecd with his bold, resonant strokes, powerful gamaks and bol work, the imaginative texture of his high speed taans and occasional lyricism brought in through controlled touches and evocative, perfectly executed murkis."